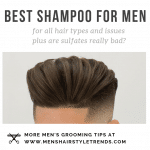 We review 1000’s of new men’s hairstyles and cool haircuts for guys every week that are being cut and styled by the best barbers in the world. 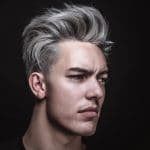 The top haircut trends at the moment are longer messier hair on top combined with a variety of fades and undercuts for short clean kept sides. We are also seeing a lot of blow dryer work creating more natural dry slicked back looks held in place with a quality matte pomade. Be bold and try something completely different. 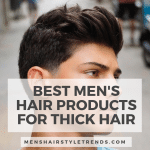 Find a brand new look from this list of the top 100 men’s hairstyles and haircuts and update your style. Look good, get noticed! 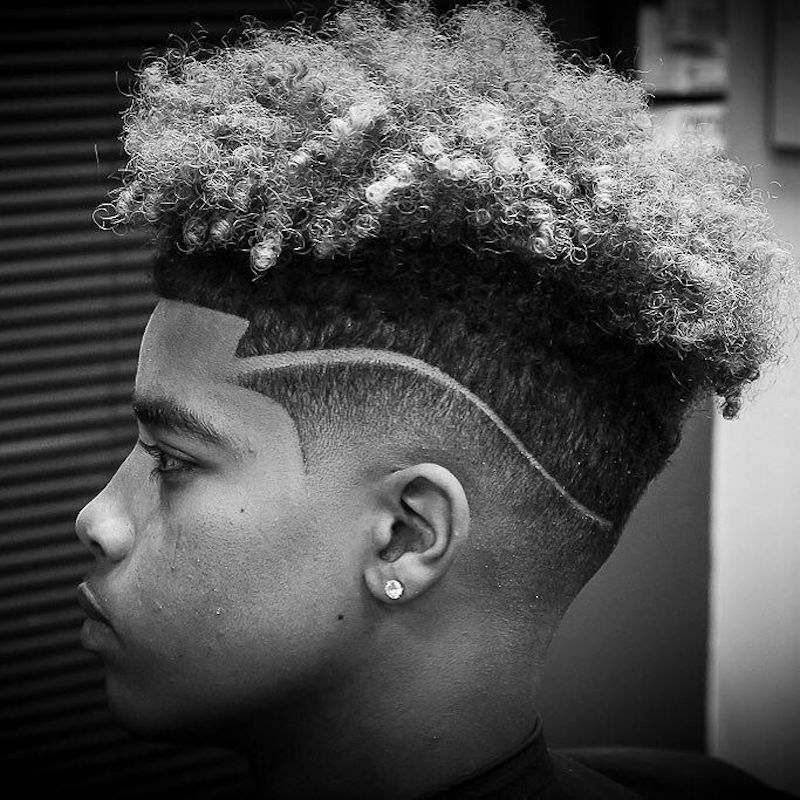 A very cool men’s haircut with lots of volume and flow. Sides are cut short with hair left longer on top. Blow dry your hair up and back after washing. Use a brush to keep things neat. After, apply a medium to strong hold matte finish pomade to keep that volume going all day long. 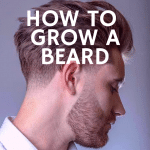 An easy to manage short textured haircut with beard for some extra attitude. Towel dry your hair and work a small amount of hair product evenly into the hair. Push the hair around in different directions and use finger tips to maximize the movement of the textured hair. 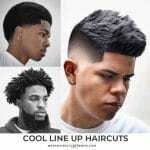 A cool short haircut for men that is versatile allowing for many different men’s hairstyles. One of the coolest undercuts we have ever seen. 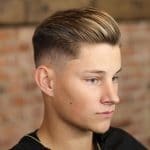 The undercut is one of those hairstyles for men that is going to stick around for years to come. 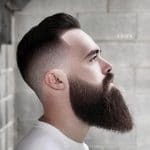 This one is super cool with long hair on top and a long fringe down to his chin, combined with a big beard and an amazing geometric hair design. One of the best short haircuts for men of the year. A nice clean mid to high fade on the sides with short easy to manage hair on top. A professional look for the office but cool and stylish for fun times. 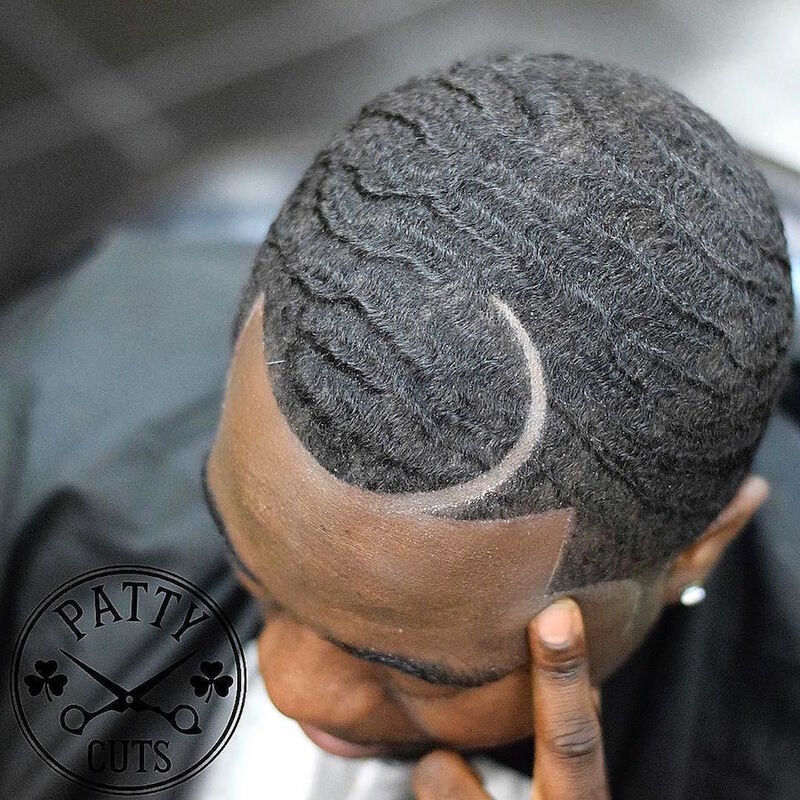 A crisp high fade with shape up around the hair line. Wavy hair trimmed down for a nice short men’s hairstyle with movement. This is a stylish men’s short hairstyle that features a bald fade on the sides and a messy crop on top. Here we have a great look that appears to have drawn inspiration from the classic skater haircut from the 1980s. 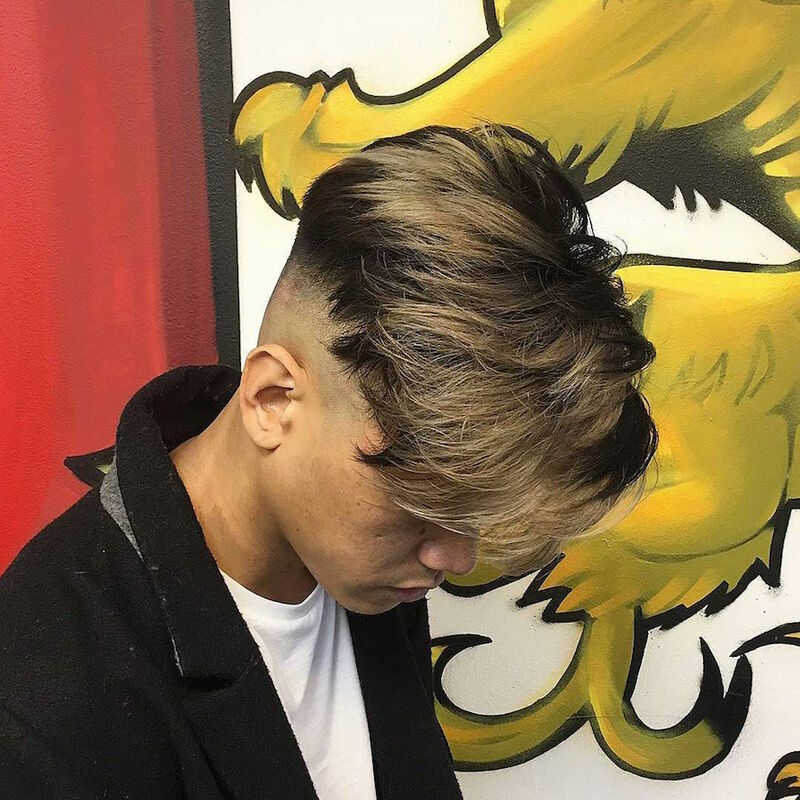 A mid fade on the sides with long hair on top and a long fringe up front. Pompadours are so cool. There are infinite possibilities depending on how you style the hair, or how long you grow it on top. 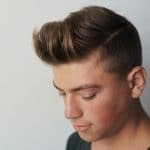 This medium length pomp is longer in the front and graduates to a shorter length towards the back. Combined with a super clean shadow fade. 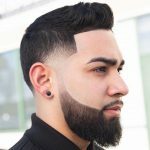 High fade with thick hair on top that has been textured and sculpted into fire like pieces of hair that gives this hairstyle for men movement. 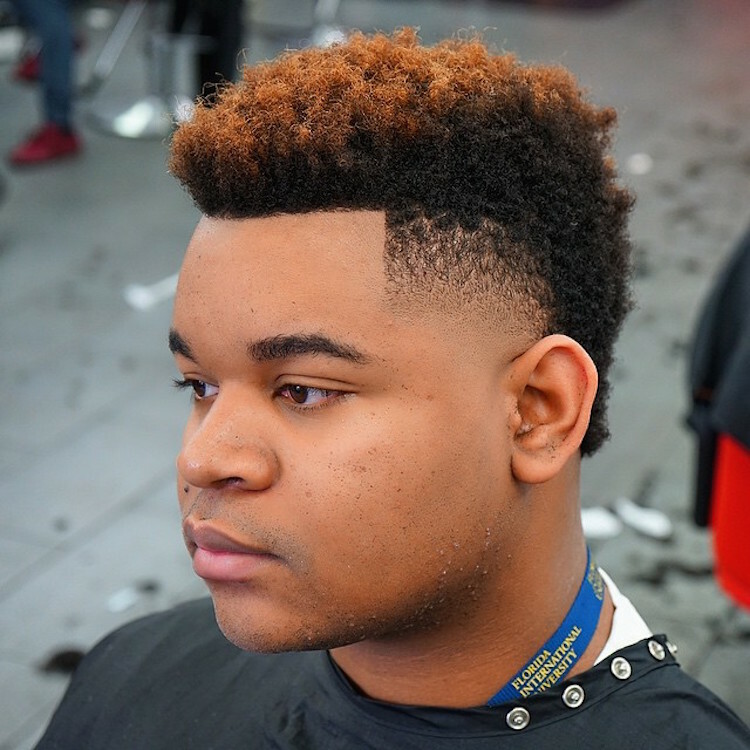 An awesome example of a high top fade with a hard part on the side for some cool detail. 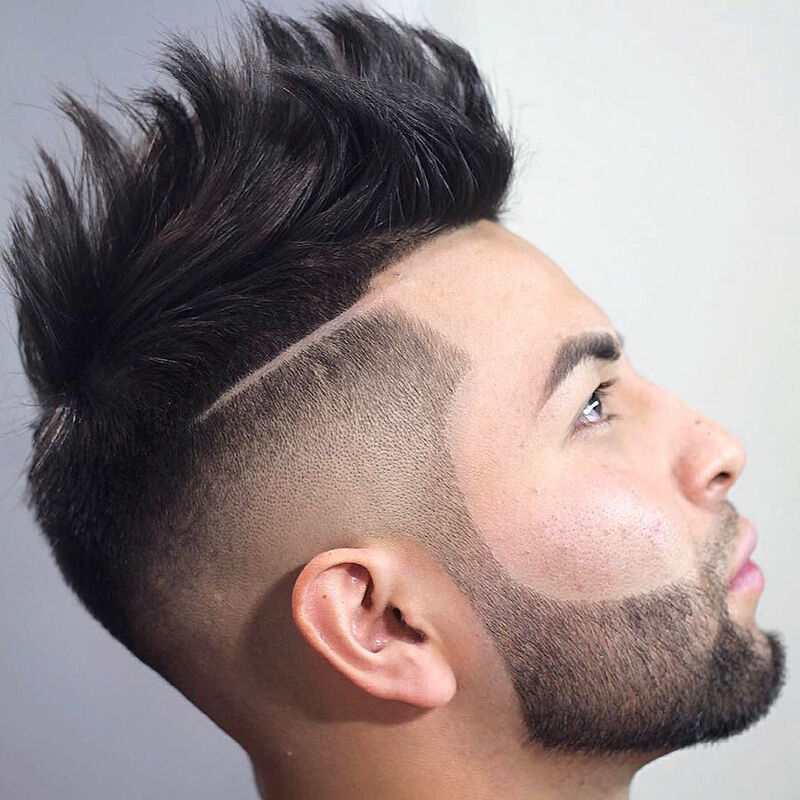 A cool longer hairstyle featuring a disconnected undercut combover. A high bald fade blended to perfection with short hair on top that has been styled into waves. 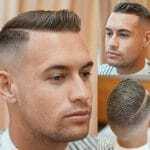 This is a very cool haircut style for men. 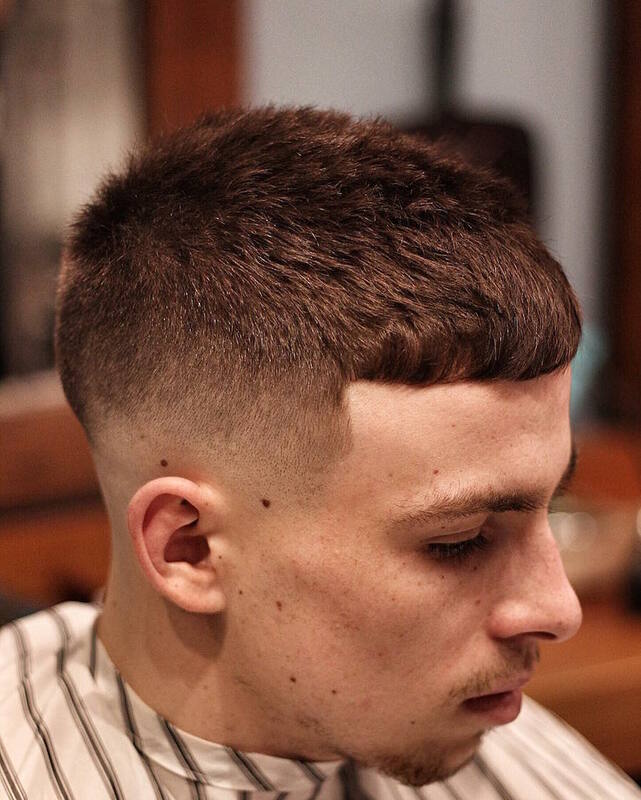 A mid skin fade with a hard part and a medium length of hair sculpted nicely on top. 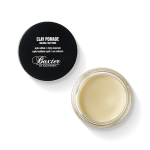 With a firm hold pomade work the hair product into your hair and then use your finger tips to bunch up the hair to create sections that add movement to the hairstyle. A classic men’s haircut with a shape up in the front hair line. This haircut is all about cool. You can work so many different cool hairstyles for men with this short spiky haircut. Use a hard water pomade (check out Baxter and California) to guide the spikes in different directions and to add some definition. Some guys think their curly hair is a problem or difficult to manage. Not when you go to the right barber. 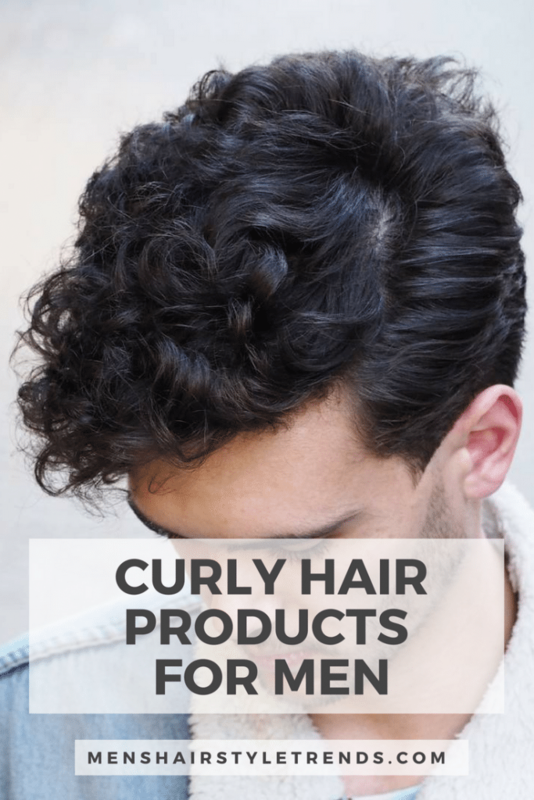 Grow out your curly hair a bit longer to give your barber something to work with. This look is simply awesome. 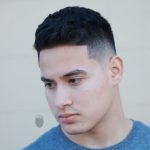 The mid bald fade brings out the life of the long curly hair on top that can be styled loose and natural or neatly slicked back for a cool men’s hairstyle. This is a super cool hairstyle. Big hair on top, long fringe in front, and sides cut short. To get the style use a blow dryer and hair brush to create volume. 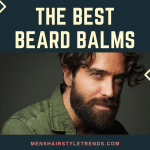 Put into place with a firm or strong hold pomade. Such a cool haircut for men. This is one of the most creative we have seen. A hi/lo fade with a double hard part for some cool design on the sides. The thick hair on top is styled back into a cool pompadour. 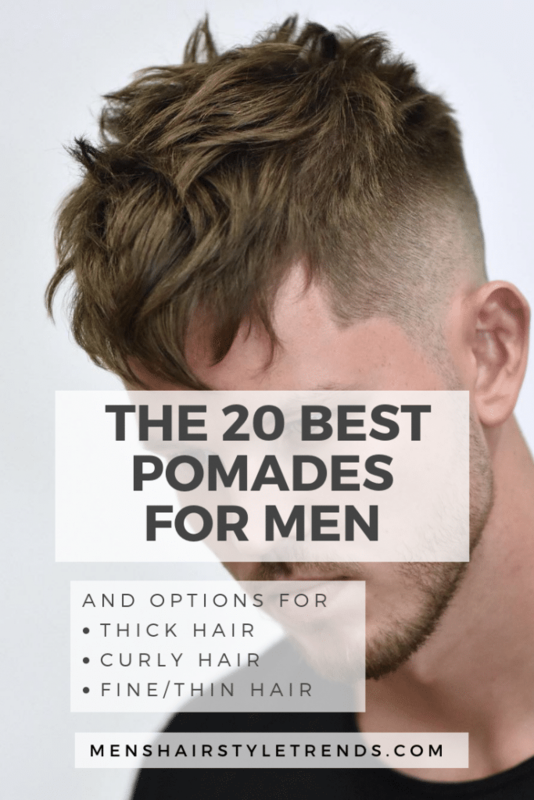 A timeless medium length hairstyle for men that want to may be traditional but also want to stay cool ad look current at the same time. A popular men’s haircut for eternity. Short hair blended on the sides into a medium length of hair on top slicked back to put emphasis on your face and eyes. Keep it simple with an ultra short haircut. The hard part and mini pompadour gives the classic men’s haircut a modern look. Easy to style. Just work a pomade with a bit of shine into your hair and get out a comb to work your hair into place. 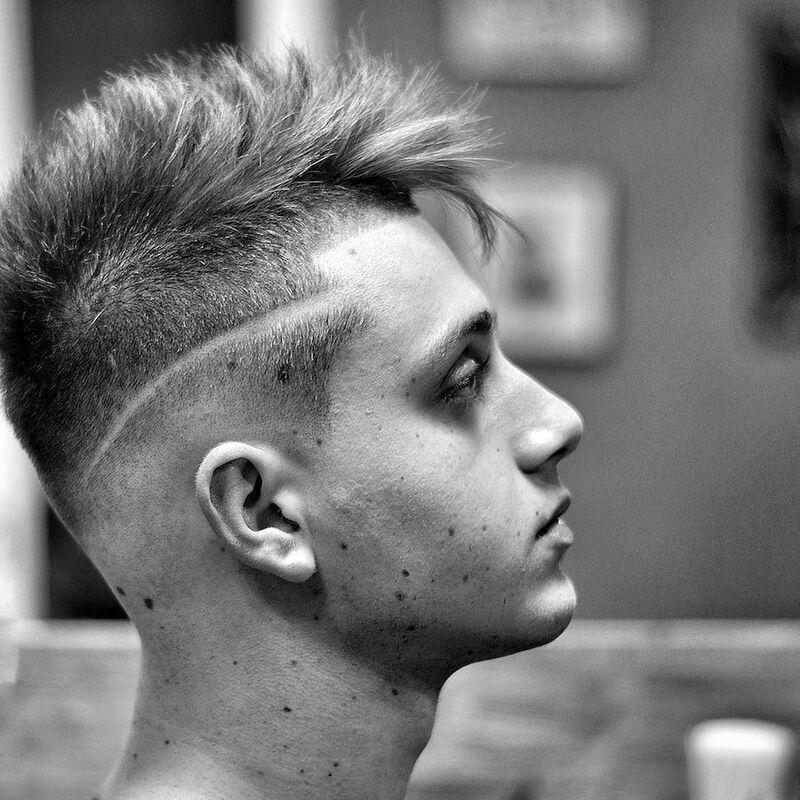 A cool medium length men’s haircut with spiky textures on top and a wild low fade with a step to add contrast. Very unique guy’s haircut. The textures on top give the hair some great movement to the hair style. This is how you make curly hair cool. 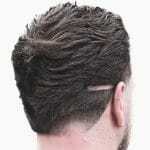 A high fade with a disconnected combover undercut. The curly hair on top is left long and wild. A modern take on the classic men’s slicked back haircut. The hair is styled using a blow dryer and wide toothed comb to create the separation and detail. Use a strong hold matte finish pomade to keep the hairstyle in place. 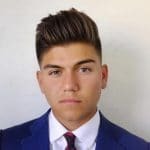 A truly alpha male haircut. This could be the most popular male hairstyle of the year. It was a very popular look. A high fade combined with a textured pompadour quiff. 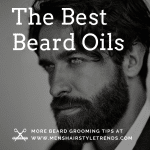 To get this cool men’s hairstyle work a generous amount of stronger hold pomade into the hair. Use your palms to work the hair to the side perpendicular to the disconnection and also pull it forward using your fingers. Work and move the hair into the direction you desire. You can also use a blow dryer first to give it some extra movement and volume that your pomade can keep in place. Undercuts are still a very popular choice. 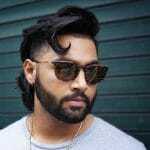 They have been a go to male hairstyle for several years and still look cool as barbers create more and more versions of this super cool look. 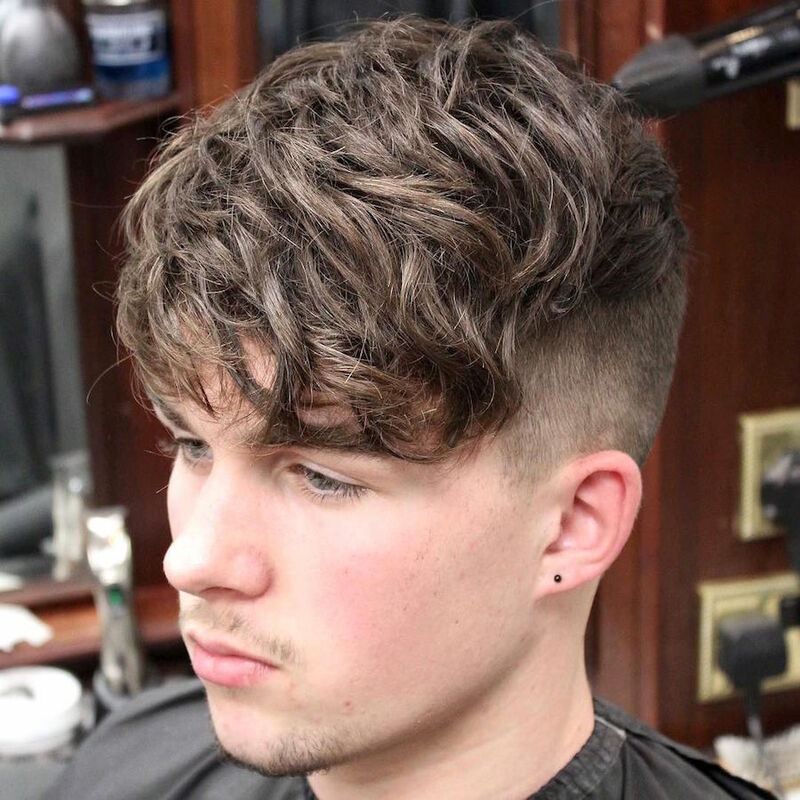 Here we have a curly hair undercut that leaves the hair on top very natural looking in combination with ultra short sides. 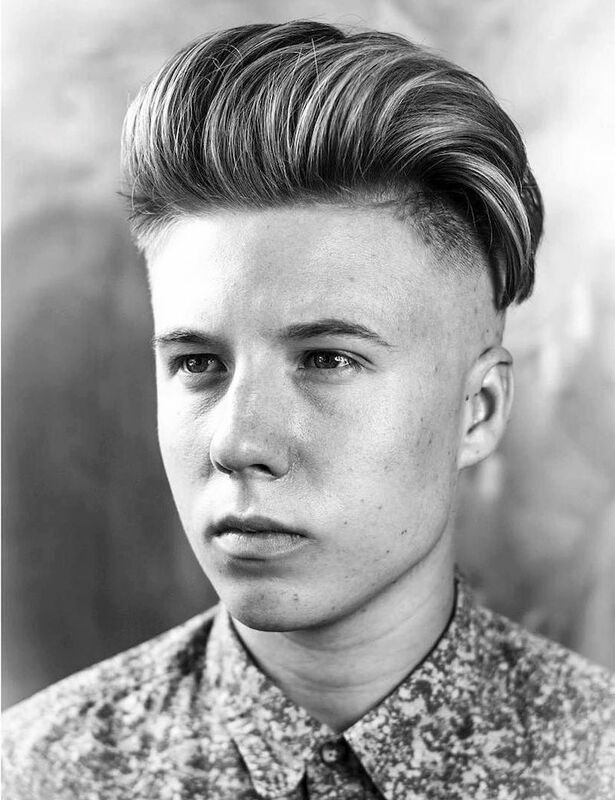 Another amazing example of the undercut hairstyle but with longer thick hair on top and a bald fade on the sides. Perhaps the most notable men’s haircut this year. The short crop, this one also a disconnected undercut that sharply contrasts the ultra short sides. Hair is left long and loose on top. If you have thick or wavy hair this is one of the best haircuts you can get. The longer hair is disconnected from the clean cut short sides. Simply towel dry or blow dry and go. One of our most favorite hairstyles for black men. 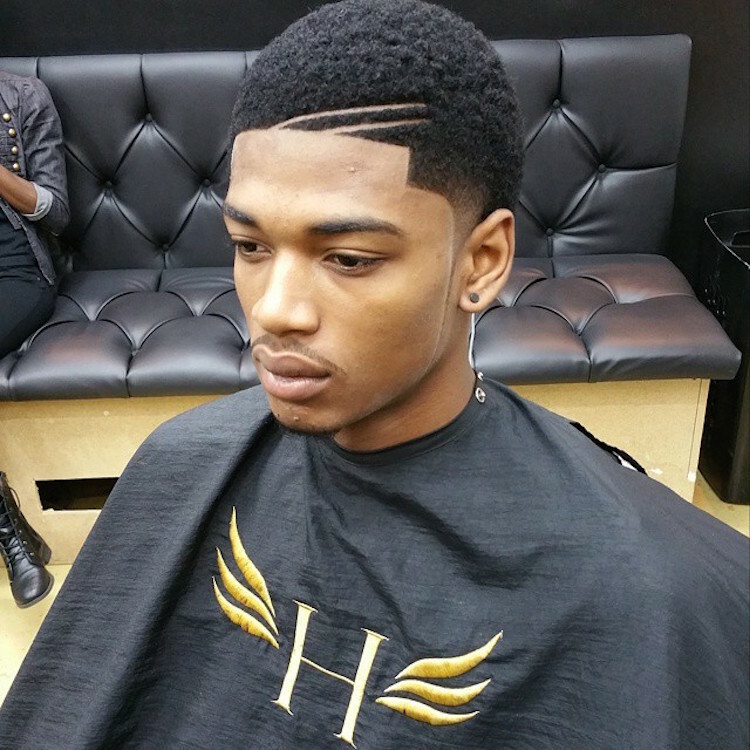 A taper fade keeps the look fresh and clean while the naturally curly hair on top is twisted into fabulous curls. 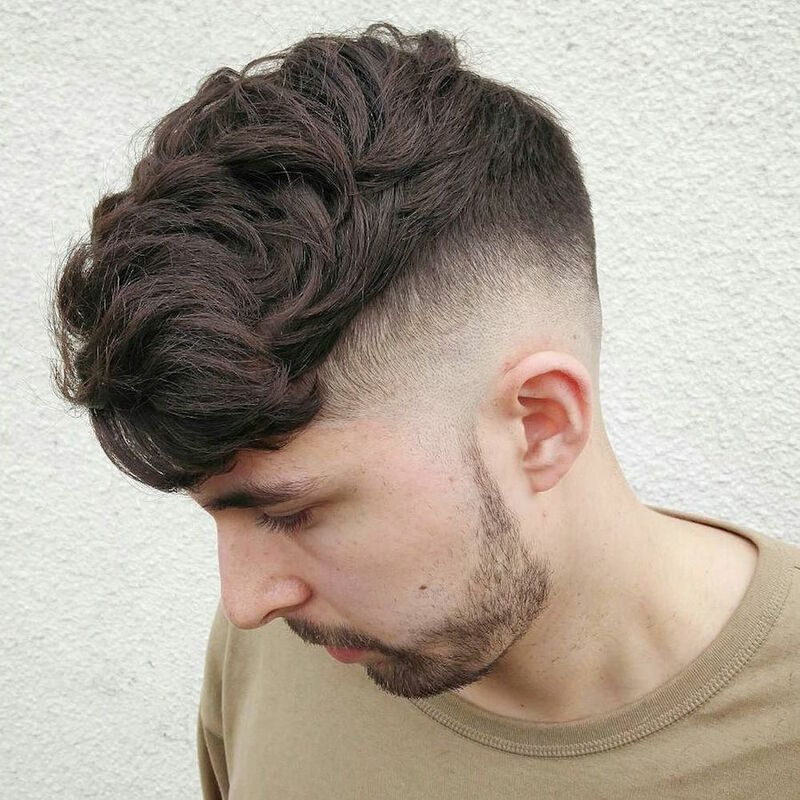 Another amazing haircut for guys that have curly hair and think they can’t get a nice but cool haircut. The longer curly hair is kept heavier up front in the fringe, but short on the sides and back. 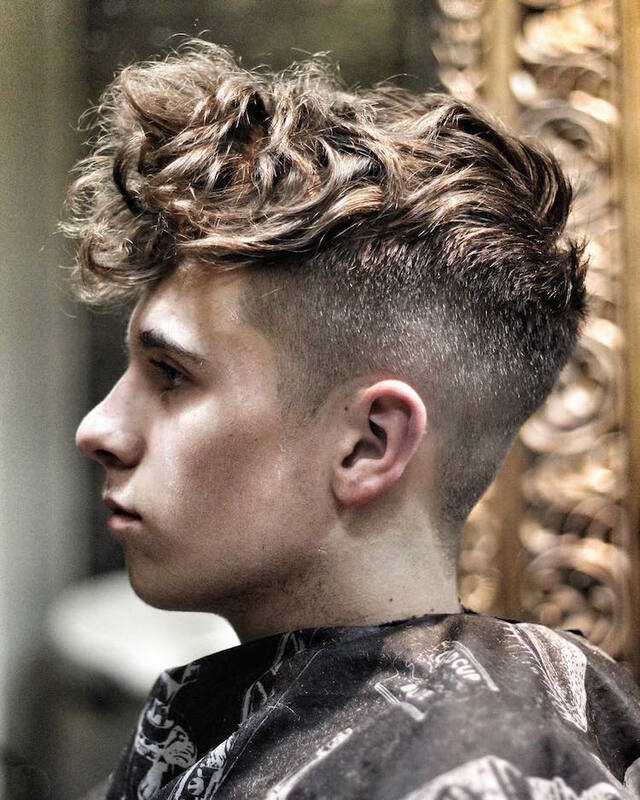 This is one of the best curly hair haircuts for men that we have seen all year. Clean and crisp on the sides, hard part, and natural curls on top left to do their thing. This is the best undercut. Cut very short and high on the sides leaves the thick and longer hair on top almost in a mohawk. So cool. One of the best men’s haircuts by Mikey. Another style that screams alpha male. An undercut slicked back into a very manly style. 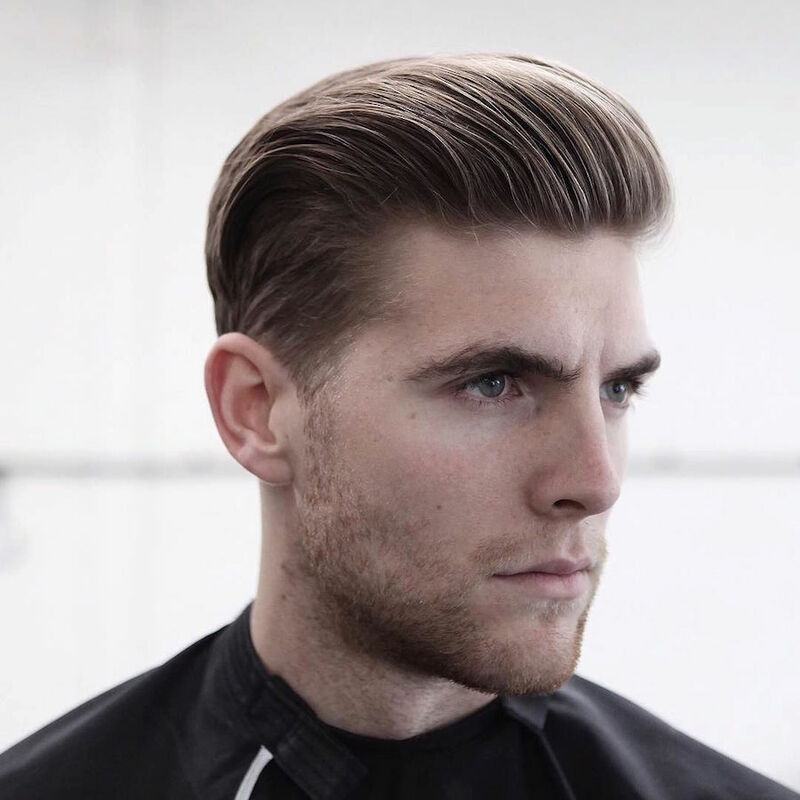 To get the style…blow dry, use a strong hold pomade like Imperial Barber Classic and work into your hair. 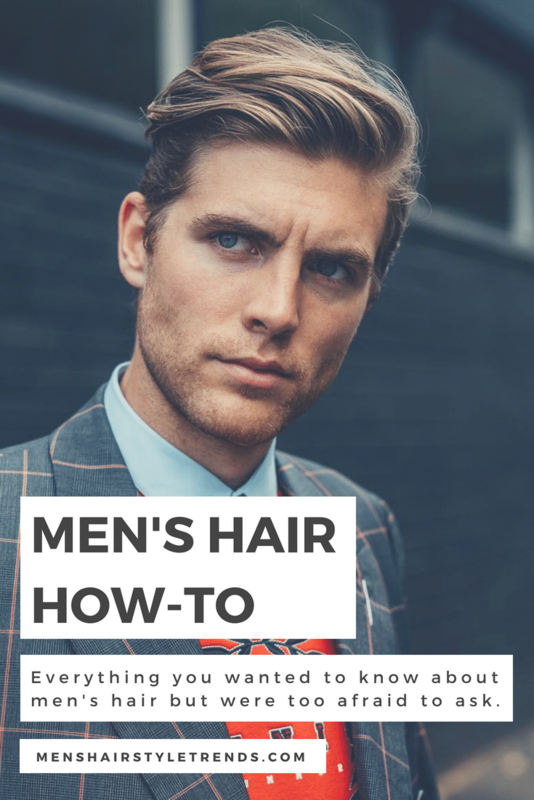 Use your hands to slick the hair back or use a comb or brush. An innovative barber creates a unique men’s hairstyle. We have a cool looking half hard part combover styled into a loose pompadour. 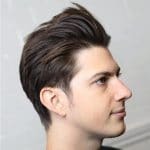 A pompadour undercut combover hybrid hairstyle for men. A classic combover pompadour haircut styled to perfection. 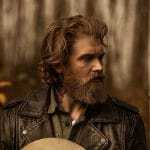 Great beard + cool hairstyle. Another creative pompadour hairstyle. 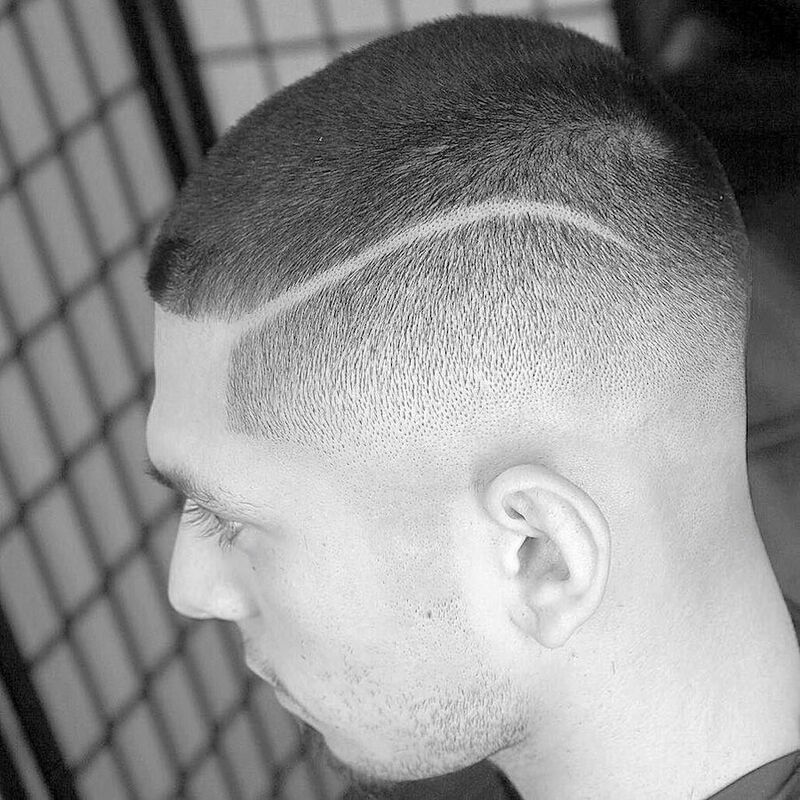 A surgical part separates a high and low fade. Awesome blowout all shaped up including a fine styled sideburn. This haircut wins the prize for creativity. Your classic men’s haircut typical of the business world for so many years. 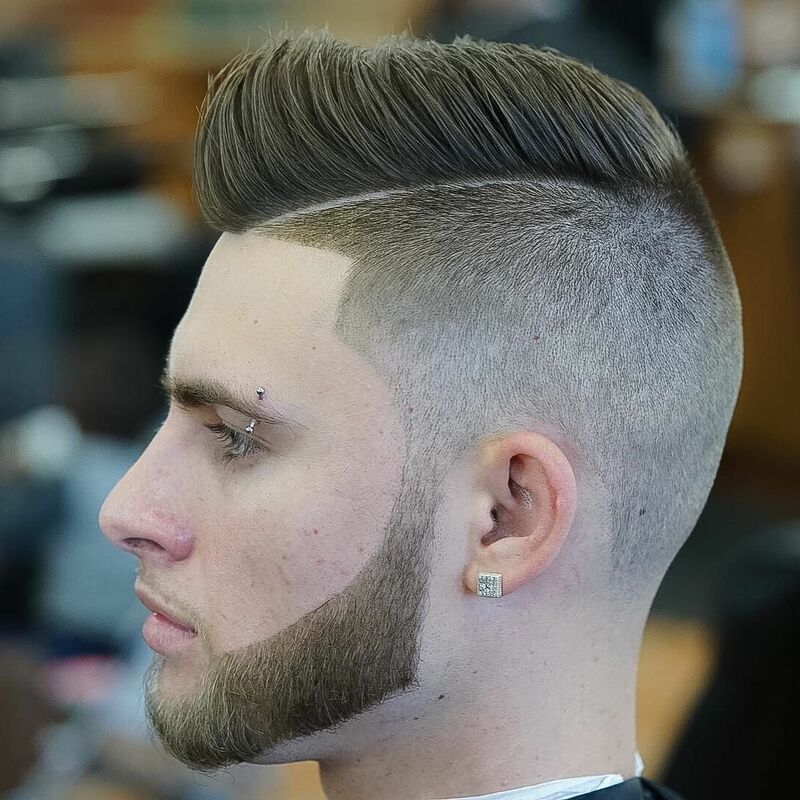 This unique men’s haircut is brought to life with a sharp bald fade and step on the sides that exudes a screw you bad boy attitude. Icing on the cake with the disconnected beard and neck tats. Love it. Medium length curly hair twisted up. Nice and clean sides and double hard part for style. Keep an eye on Braid Barbers if you want to get an edgy look. Here we have one of the first crops seen in the year with a disconnected beard, bald fade and hard part. 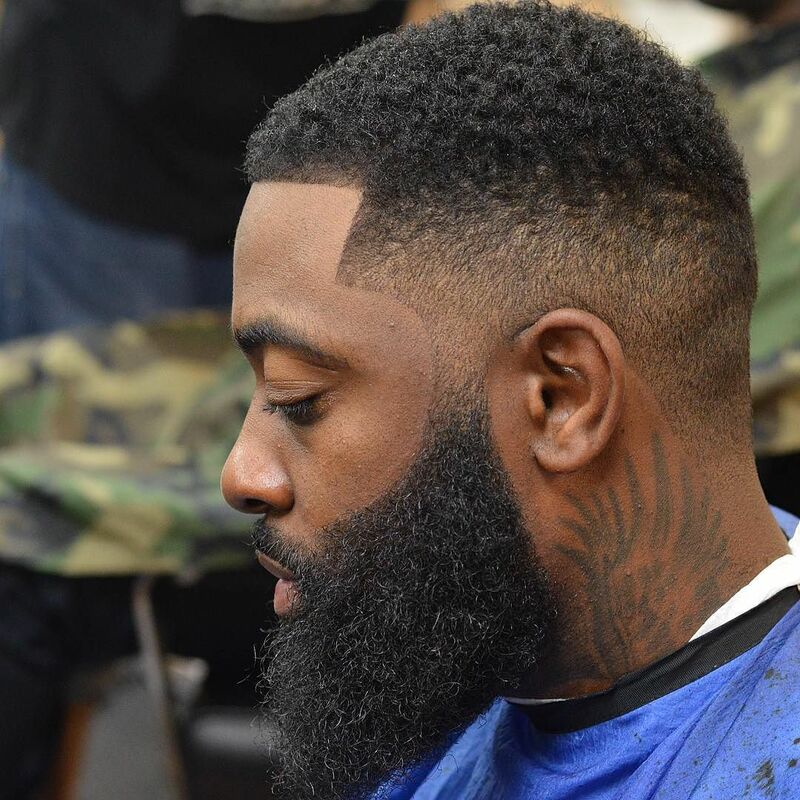 One of the best haircuts for men that want to stand out in the crowd. Very cool design etched into the temple area. The best temple fade of the year! Faded high and low and split by a surgical part. On top we have a long hair pompadour running wild. A beautifully textured short haircut for men. Perfect if you want to be all business at the office. 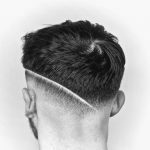 A sharp cut surgical line to separate a bald fade from the rest of the head that is clipped ultra short. If you have thick or wavy hair work it with a cool slicked back hairstyle for men. This high bald fade offers noticeable contrast and gives movement and life to the hair left natural but neat on top. A view from above of one of the most popular men’s haircuts this year. Mid to high fade on the sides with a pompadour quiff up front. A side angle of the men’s quiff. We have a high skin fade with hair on top being styled into a neat messy look. 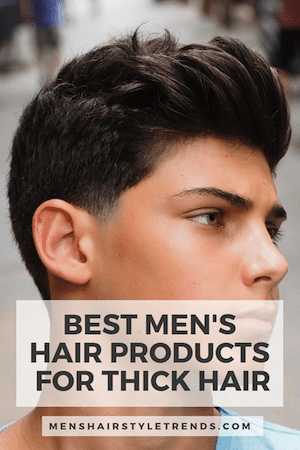 Another look at one of the most popular hairstyles for men. 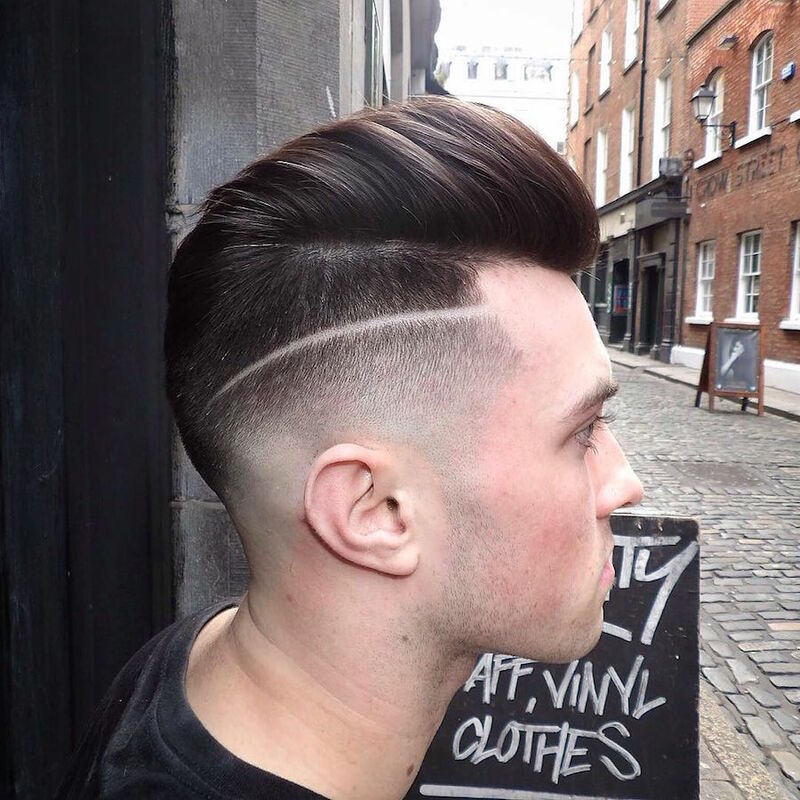 High skin fade on the sides and longer messy hair on top sculpted into a pompadour. A low fade with thick textured hair on top styled into a quiff. If you want cool and classic this is the best men’s haircut you can get. Bald fade and medium to short hair on top. A shorter version of the pompadour hairstyle. The high skin fade and hard part puts the emphasis on the pomp. Another simple all cool male haircut. Short on the sides. Slicked back on top. Cool. Got curly hair. Cut it short for an easy to manage hairstyle for curly hair. Use a pomade with shine to get this look. Awesome shape up haircut. Clean as a whistle. And super cool detail with the hard part curve. If you have curly hair but want to keep it longer while at the same time not looking like an absolute mess, this is the haircut to get. 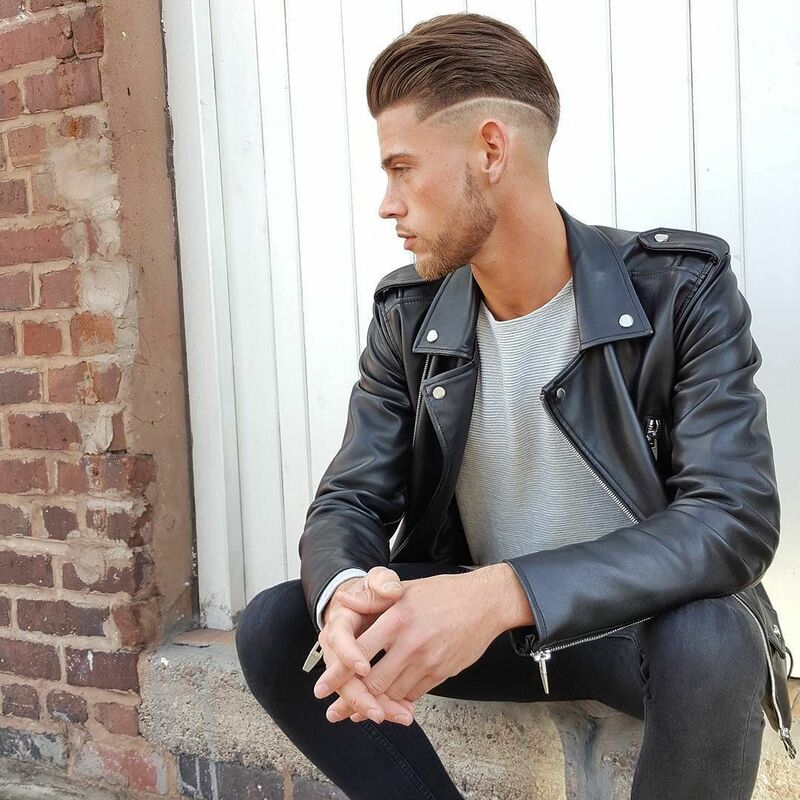 Super clean fade on the sides and back, combined with a long fringe that adds some cool style to the look. Another very cool undercut by Mikey. The sharp disconnect to this haircut style is incredible with the long fringe. 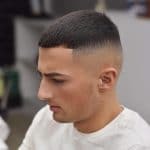 The undercut is a trendy hairstyle that will continue to be popular in 2019. It seems that each month that goes by we see new undercut haircut styles emerge. Undercuts are great because they are so easy to style and manage. 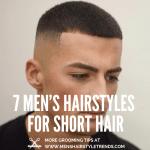 You can rock this short hairstyle for men with or without hair product. 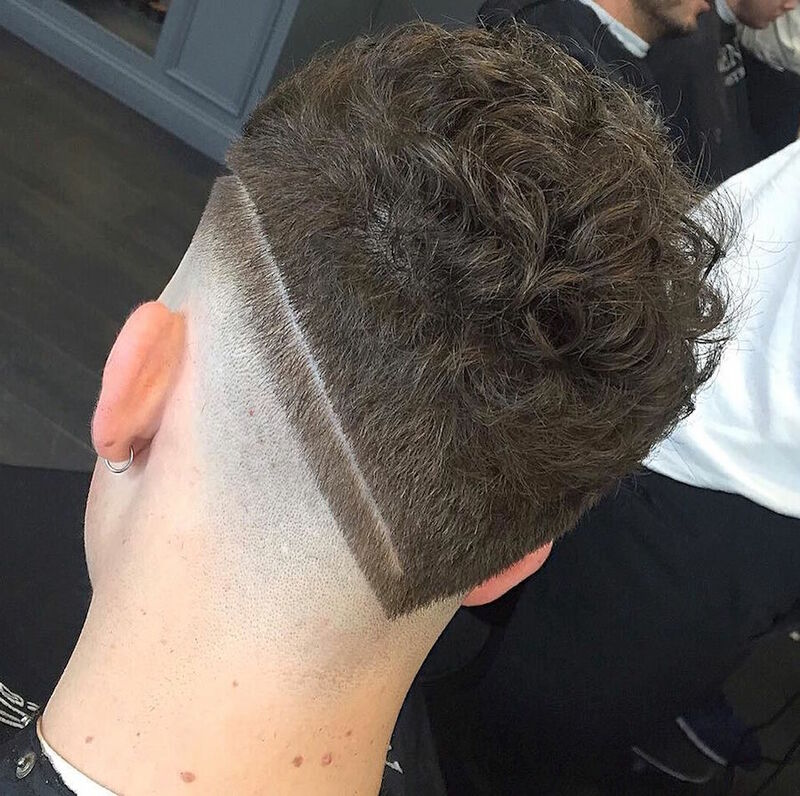 An amazing short curly hair haircut with a high fade. 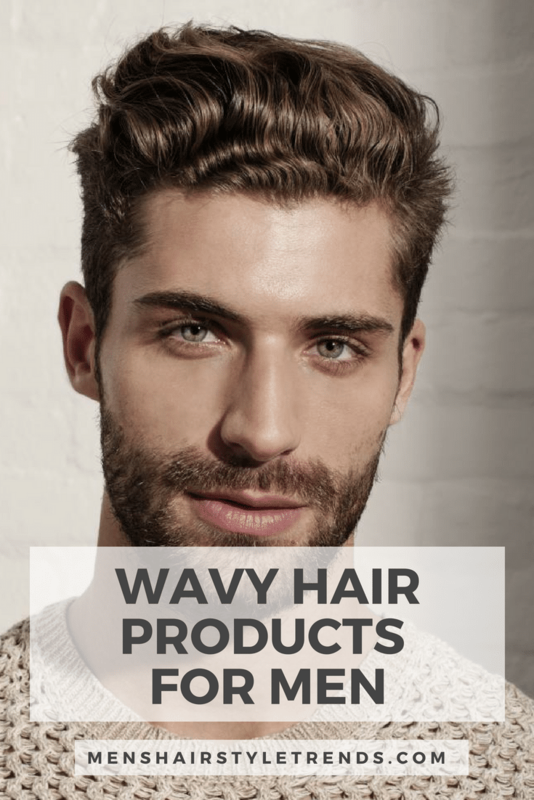 Curly hair looks so good cut short and slicked back with a pomade that has shine. This is a cool haircut. 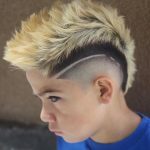 It is a hybrid of a combover fade haircut and an undercut that is more disconnected towards the temple. 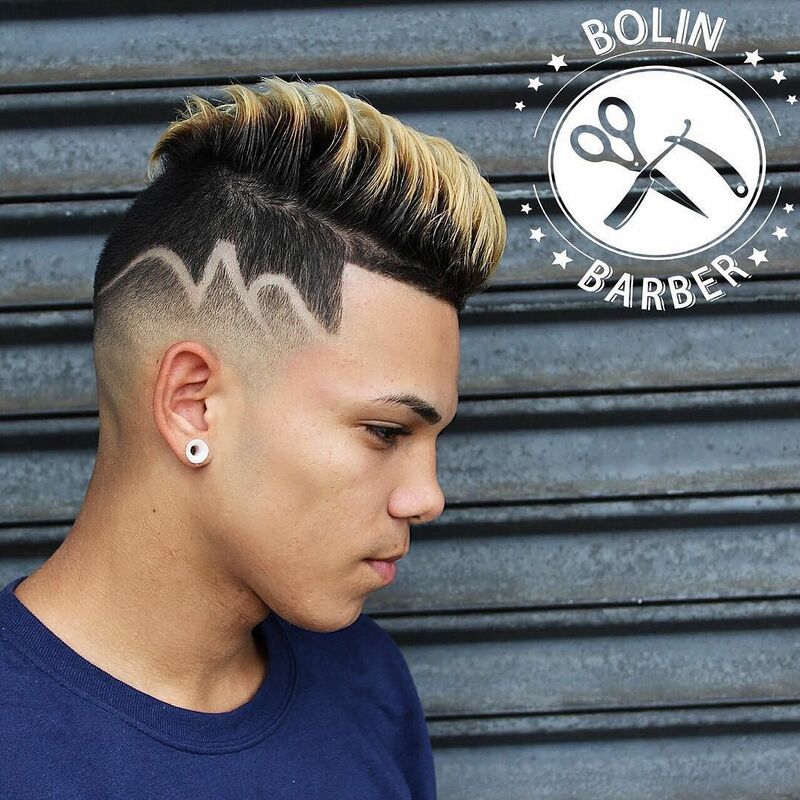 The burst fade haircut is all about making a bold statement. One of the best haircuts of the year. The ultimate of short haircuts for men. If you have thick hair this is a great option for the summer months or if if you live in a hot climate. Keep things looking and feeling cool with an ultra short clipper job. 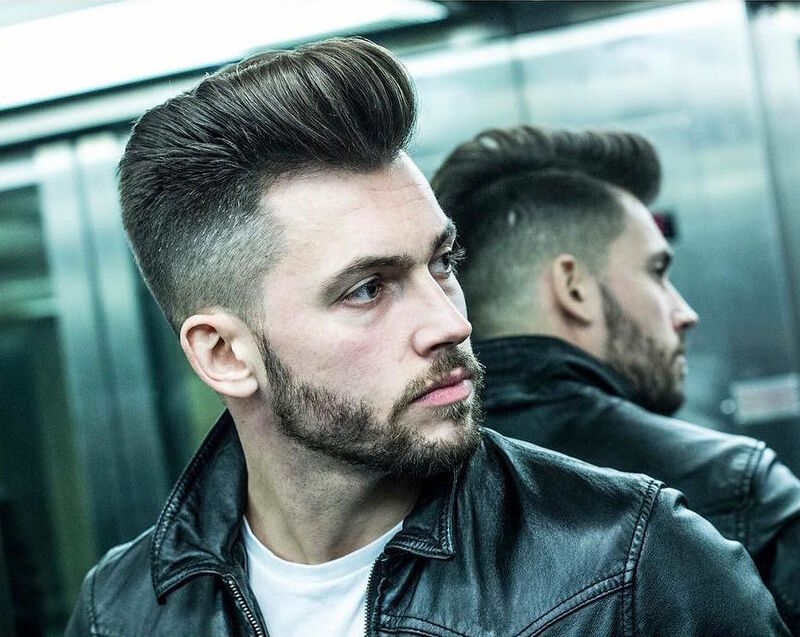 This textured quiff features a cool low bald fade blended into a medium length of hair on the sides and longer hair on top. 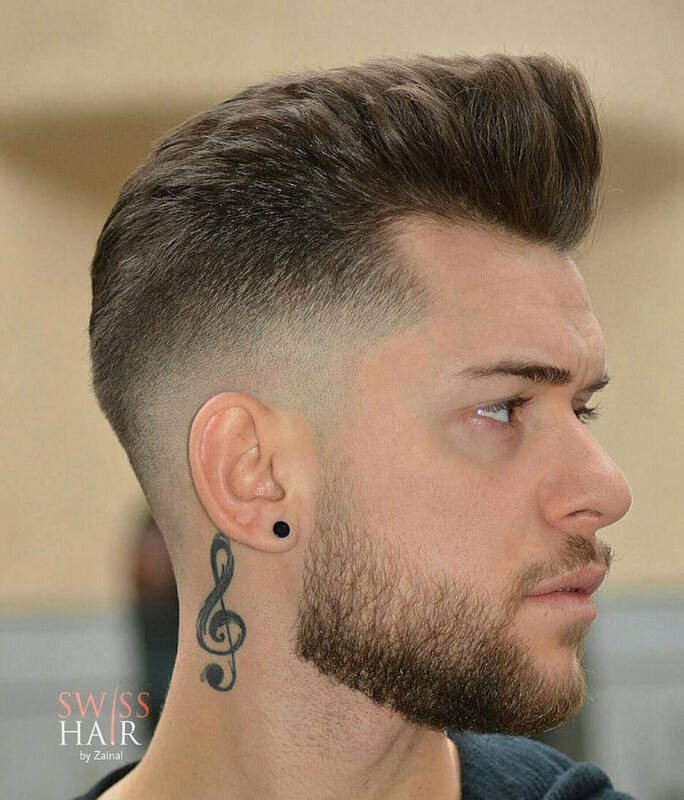 A cool modern haircut that shows multiple hairstyles in one with a very high bald fade that creates an undercut combo pompadour mohawk look. As in the last hairstyle this one also shows multiple haircut styles in one. This time a mix of a short undercut and a men’s crop haircut. 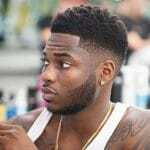 A perfect taper / temple fade freshy and short hair styled into waves. 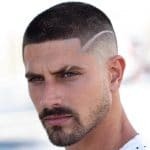 This is a very cool men’s haircut that will be around for 2019. It features a low bald / drop fade and messy choppy medium length hair on top. If you have thick hair this is a great looking haircut for you. This hairstyle is all about the long hair on top and long fringe in the front that contrasts with the sides cut short. Looks great with the beard. The best of both worlds. Short hair on the sides and long curly hair on top let loose all natural like. Add some detail to your ultra short haircut for men. But be prepared to get that surgical part cleaned up every week. Another great example of how to make curly hair look great. A medium length slicked back. Beautifully blended from top to bottom. A versatile short men’s haircut that can be styled a number of ways. Bald fades are great for hot weather especially if you have thick curly hair. 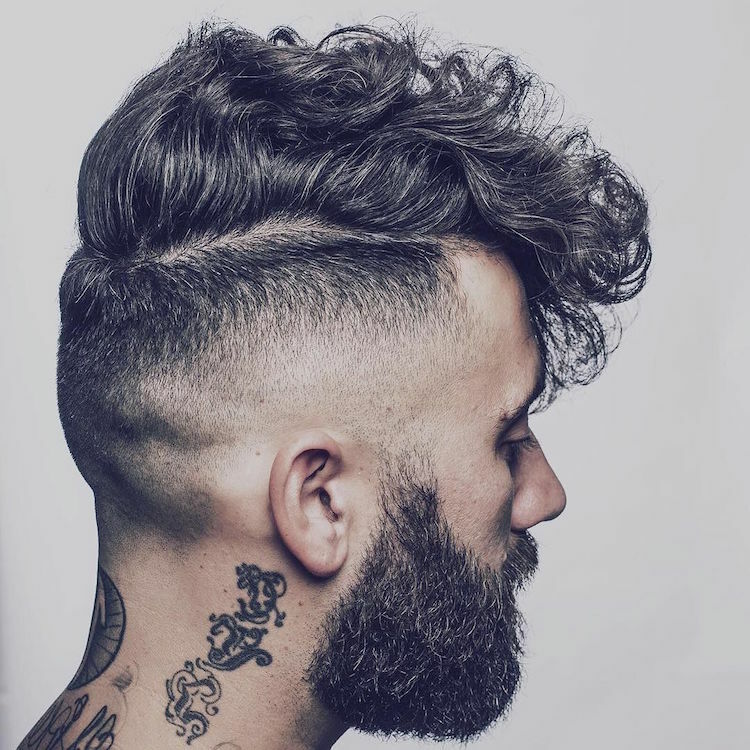 This curly hair haircuts is paired nicely with a well groomed beard. 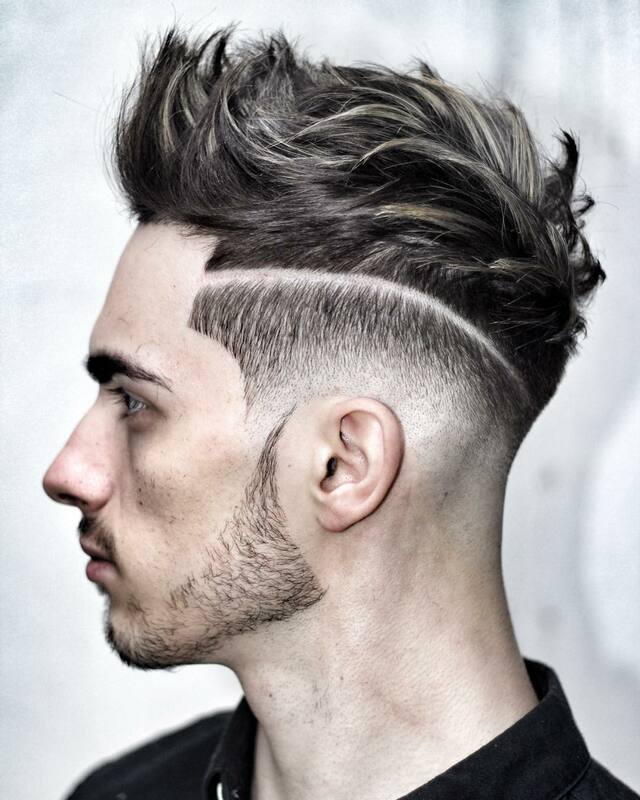 A sharp fade puts the emphasis on the curly hair on top creating movement into the fringe. 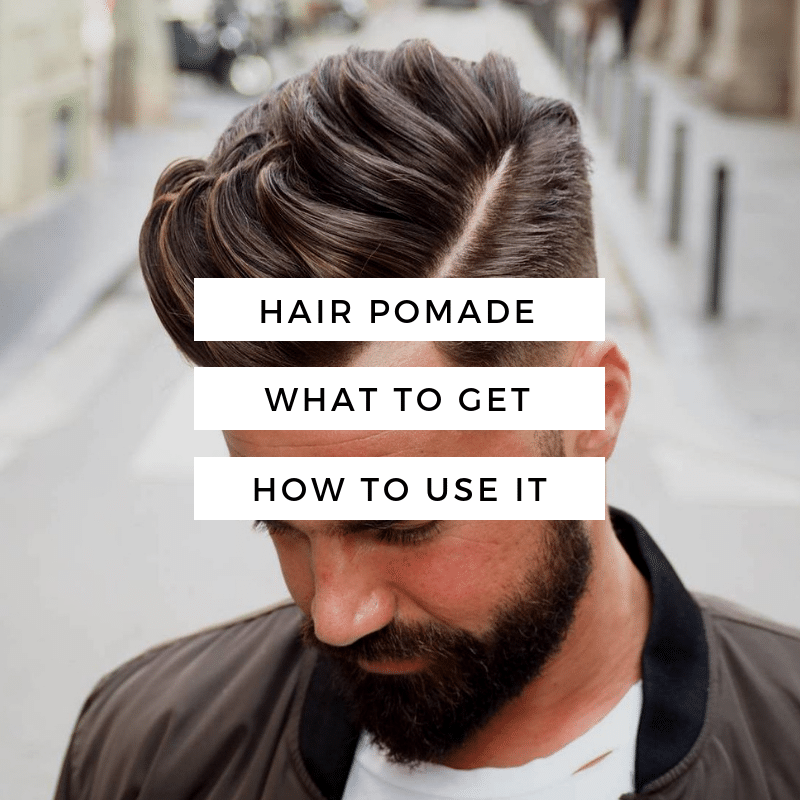 To get this hairstyle blow dry your hair back and then work in a touch of strong hold pomade. Comb or brush your hair into place. Another variation of the textured quiff that is faded nicely into a beard. Blow dry the hair and use a medium hold matte finish pomade. Your classic men’s undercut hairstyle. Use a bit of medium hold product to keep it flowing back. How many trends and styles can you pack into one haircut. 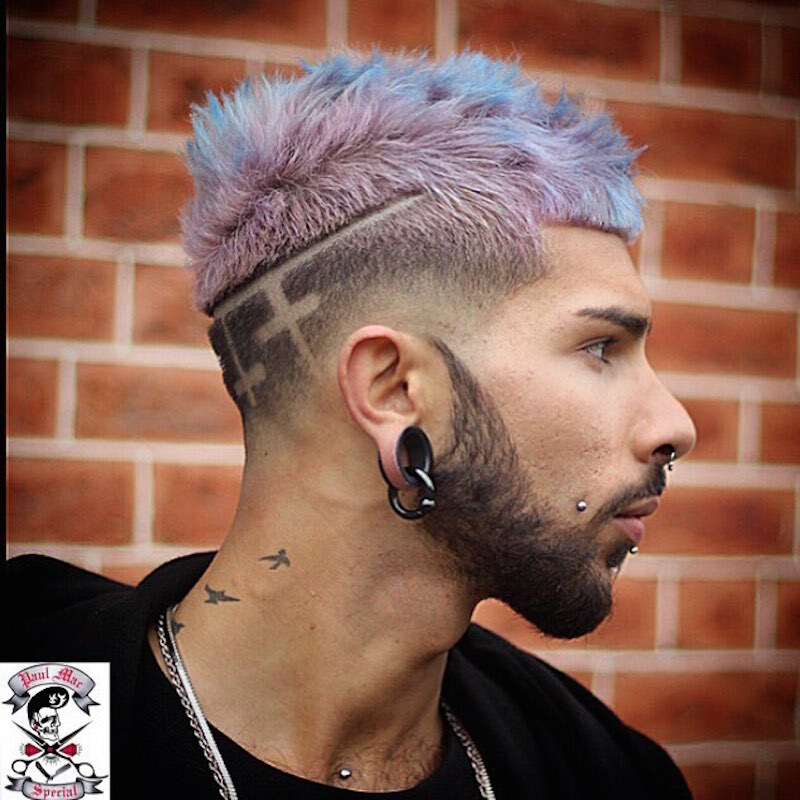 Here we have a lavender color job, hair designs carved into the back, hair textured on top and cropped in the front, and a disconnected beard. All eyes will be on you when you walk into the room. A modern blowout fade with longer natural curls on top. The side surgical part adds some flare. This haircut works really well with straight fine hair. The bald fade make the hair on top and fringe up front appear to have more volume and movement. This burst fade looks great with some length left on top. The color adds definition and brings out that mohawk look. Another version of one of the most popular men’s haircut styles of the year the crop haircut. This one is super short and tight. A great option if you have thick hair. A great way to show off thick curly hair. Party up front and all business in the back and sides with this mid fade. Incredible subtle details that turn a regular short men’s haircut into cool men’s hairstyle. 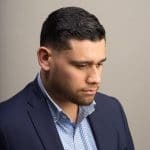 This is another great example of how to go from a classic short haircut for men to something that is a bit more modern look. The fade is high, and the hair on top is styled into a pompadour / quiff / combover hairstyle. A very cool modern twist to the hard part / surgical part. Awesome shape up and curved hard part. Another beauty by Pat Regan. One of the best short to medium men’s haircuts of the year. Mostly short, but a touch extra length in the front makes this a haircut style that can be styled so many ways. Go light on the product to bring out the textures and also maintain a natural look. 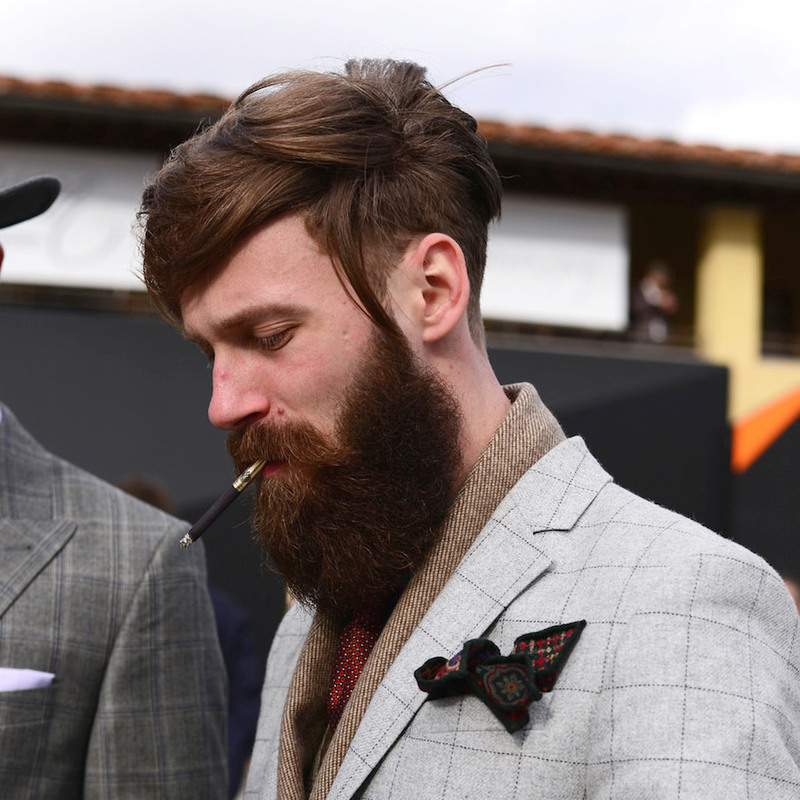 Or, use a bit more pomade and slick your hair back for a completely different look. One of the coolest pompadours of the year. 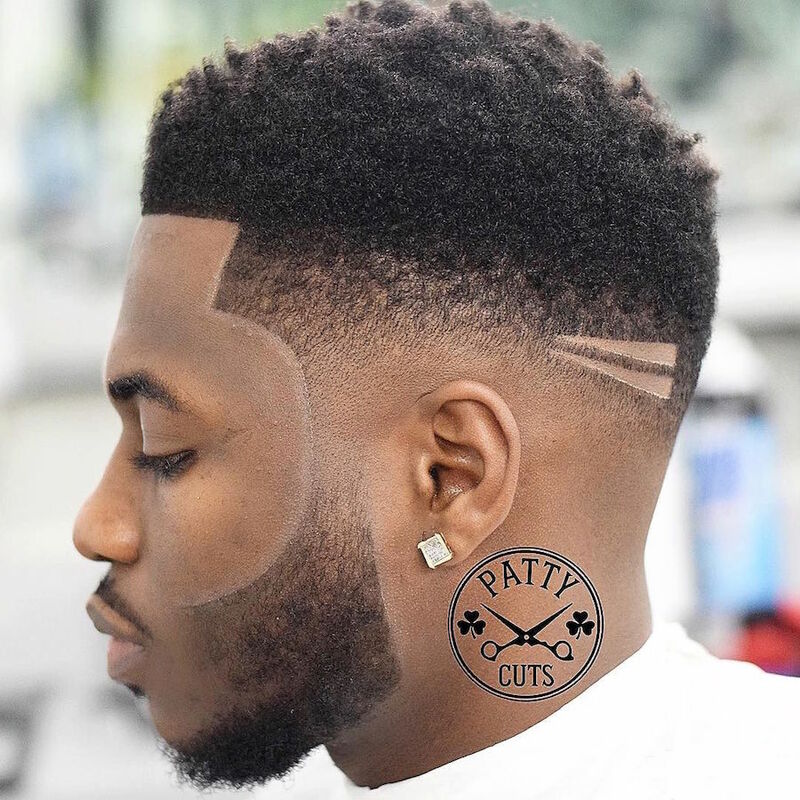 The haircut features a mid fade separated by a surgical hard part. The hair on top has extra volume created by a blow dryer. Use a light hold pomade such as ADH Dry. Sick of fade haircuts? 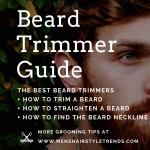 Ask your barber or hairstylist to stick to the sheers. 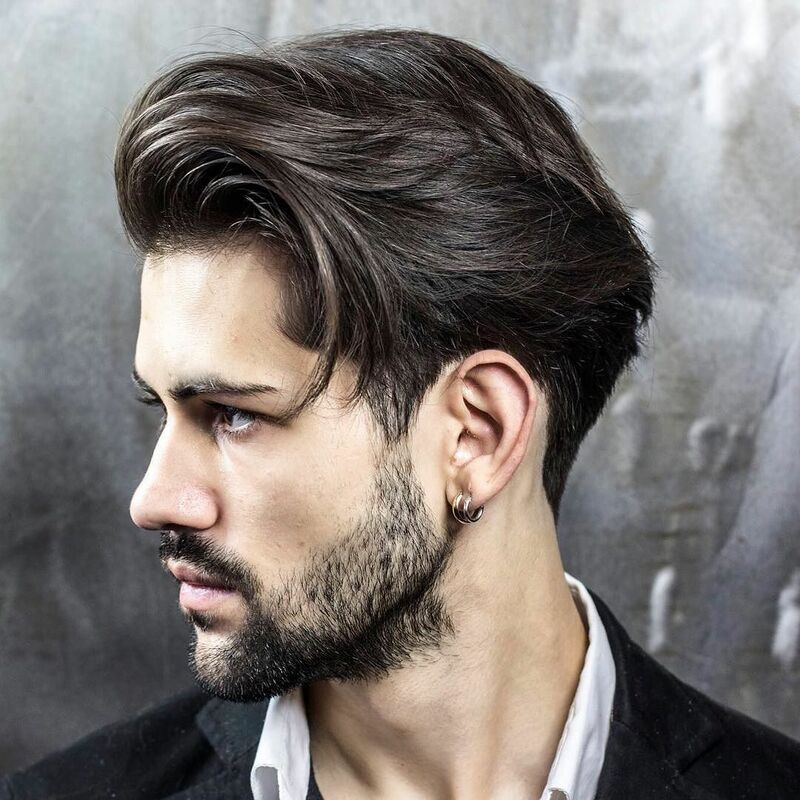 This men’s haircut has been scissor cut short on the sides and is blended seamlessly into longer hair on top that is slicked back for a classic alpha male hairstyle. An undercut and curly natural hair. Just let the body in your curly hair do its thing. No need for any hair product. A super clean shadow fade and disconnected beard. Perhaps the men’s haircut of the year. 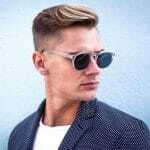 Men’s quiff haircut with side surgical part accent. Turn a buzz cut into a more modern look with a hard part. Another perfect men’s haircut for medium to long hair. Scissor cut short at the back and low sides to keep things looking neat and tidy. Low bald fade with a side hard part. Hair on top is slicked back and blended in nicely. Very cool men’s hairstyle. 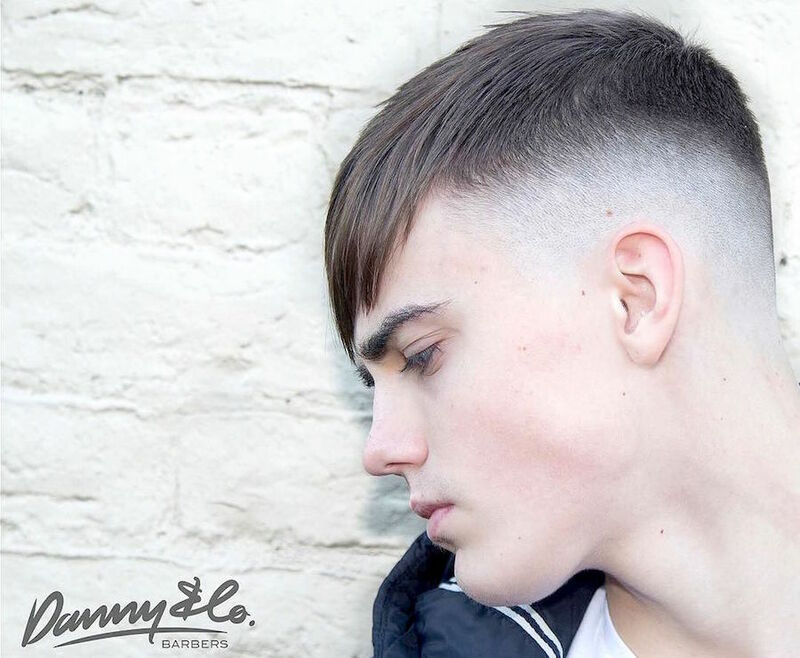 Long fringe and long hair on top with a bald fade on the sides creates a super stylish undercut hairstyle. A bit more maintenance is required for this haircut style, but it looks so cool. Hair design, hair color, and textures define this haircut. Want an easy to manage hairstyle? 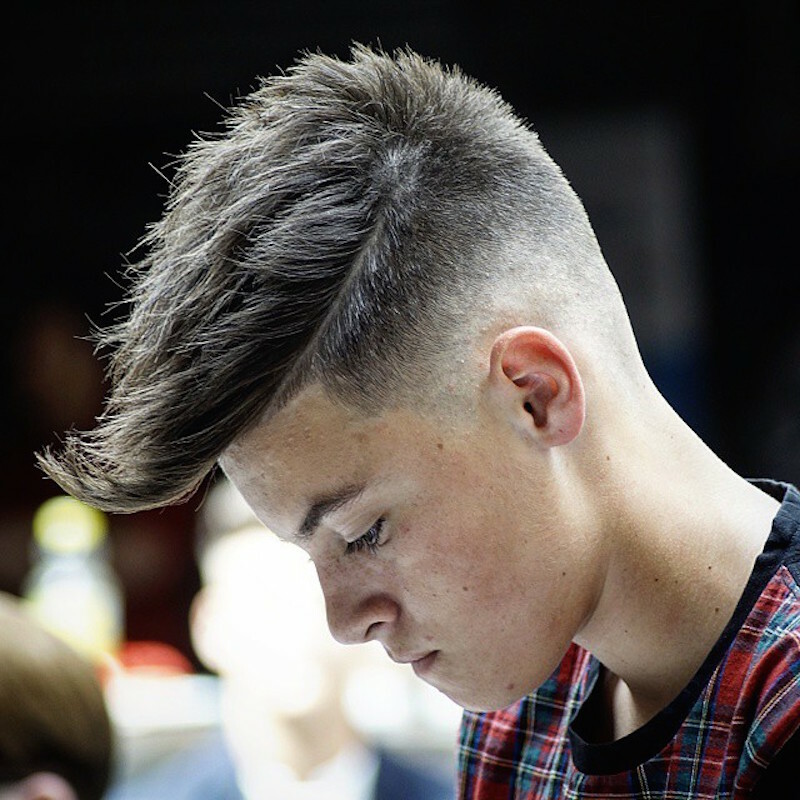 This is a cool short haircut for men featuring a high fade, surgical part, and messy textures. Simply towel dry and go. Cool x-ray hair design, bald fade, and beard. 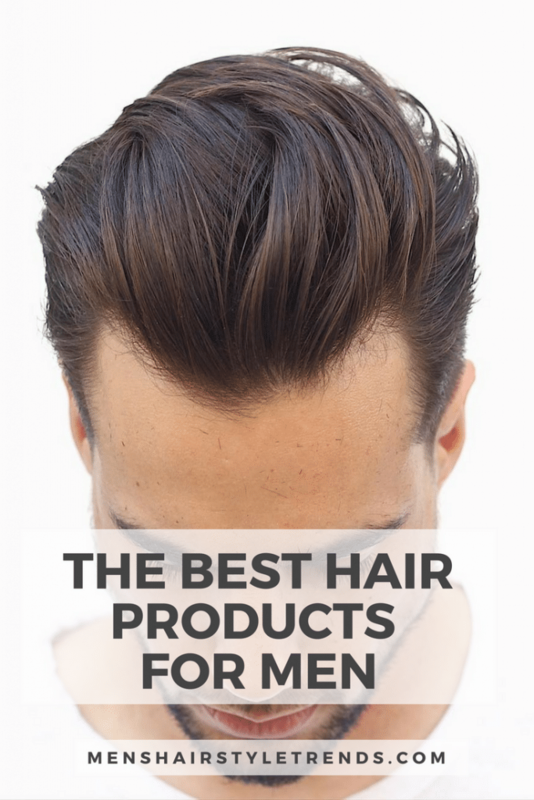 If you want to grow your hair longer and look like a modern man this is a great hairstyle for you. The look is kept looking clean with a low fade. You can keep the hair on top looking messy and wild, or add some hair product to style it in place. This men’s hairstyle shows movement in the front as the fringe contrasts with that low fade.